Can you smell that? Curry is in the air! That is all I’ve been eating while living in Southeast Asia. 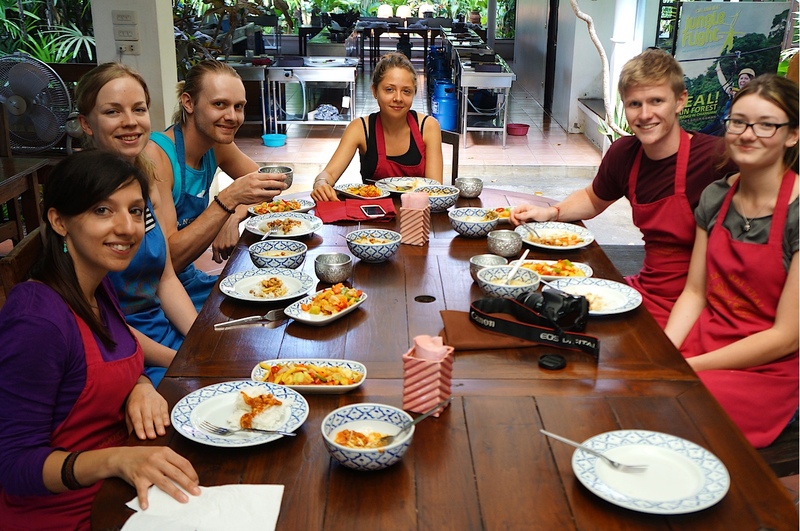 We spent a combined three months in Thailand – mainly to eat Thai street food. Food is often what pulls us into destinations. A few kilometres outside of Chiang Mai, I took a Thai cooking class to learn how to recreate traditional Thai food. 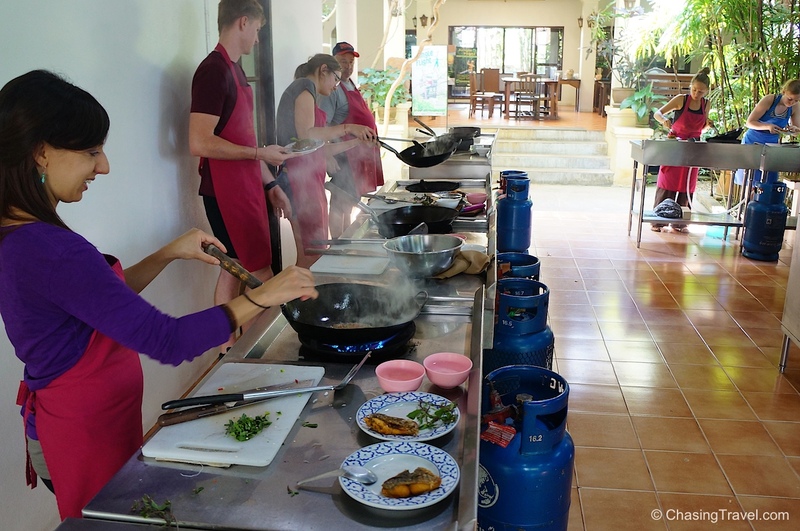 There is probably no better place than Northern Thailand to learn how to cook Thai food – the north is known for having the best Thai food in the country, being so close to the Burmese border and Lanna culture. At the cooking studio in the countryside of Flora Ville, I met Big Mama. Yep, that’s her name, given to her by her students because she passes on recipes that only Thai grandmothers and mothers pass onto their kids like homemade panaeng curry, veggie stir fry and curry paste. 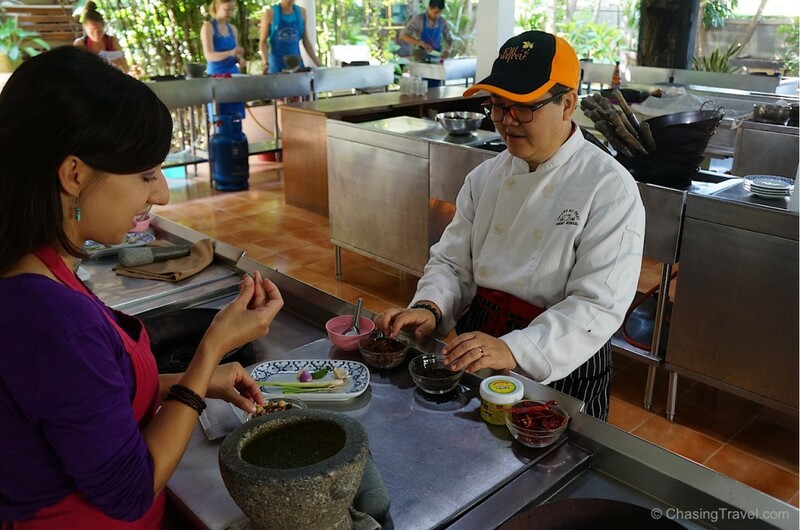 I learned to make these 3 local dishes with 2 important base ingredients that are used in many Thai recipes – curry paste and coconut oil. If you want a good Thai curry, you first need a good curry paste. 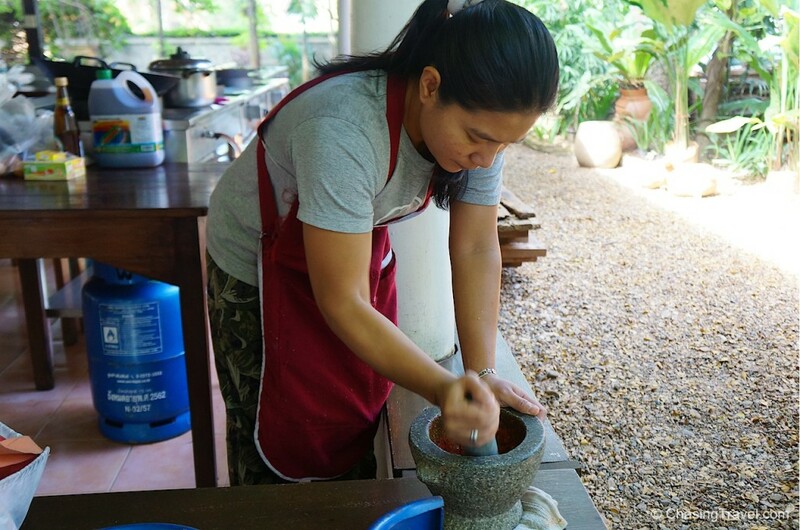 Curry paste is the heart of any curry and a traditional one like panaeng is probably the best one to learn to make since it’s often the base for many curry dishes. It’s also milder if you can’t handle too much Thai spice. First, you should try to use whole dry spices in their natural form (eg. coriander seeds instead of coriander power) and roast them to get the most powerful flavour in your curries. 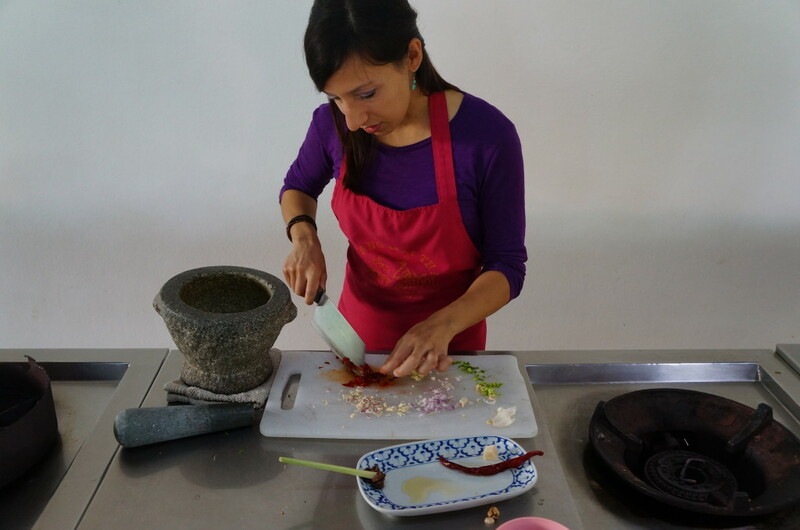 For panaeng curry paste, we roasted each dried ingredients separately in a wok until brown (without any oil) including coriander and cumin seeds, black peppercorn, cardamom, green and red chili peppers. 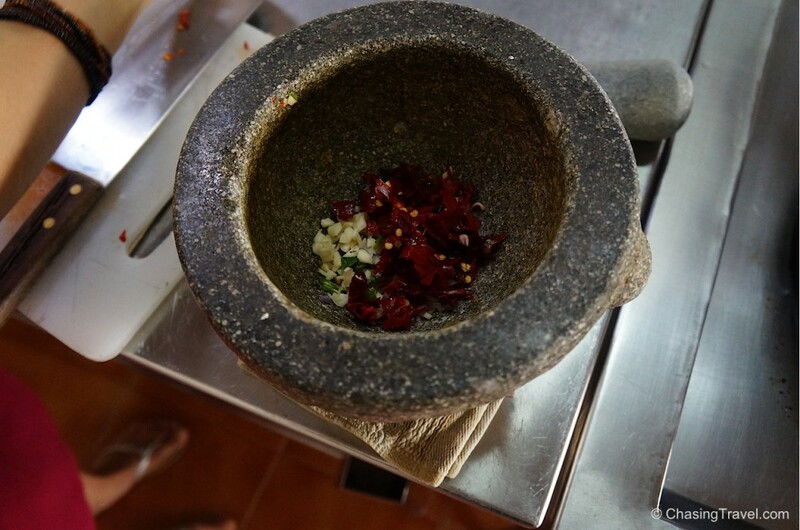 We used a traditional mortar and pestle to pound the roasted dried spices for about 10 minutes. Every Thai household has one of these but if you don’t, a coffee grinder can also do the trick. It should become a smooth paste. I was surprised how easy it was to roast my own spices and make my own homemade paste but I needed a strong arm for this or I would get lumpy paste – I’m told lumps would float to the top of my curry if my paste wasn’t pasty enough. Getting a little help from the assistant. I don’t think I was pounding hard enough. 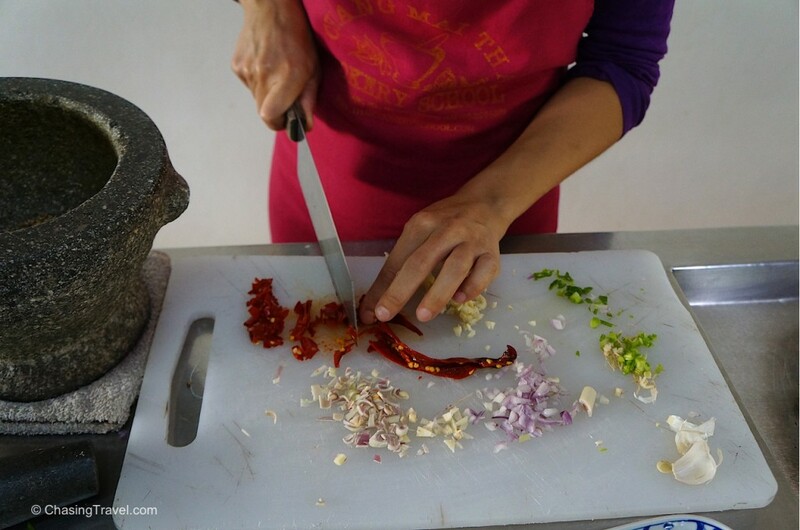 We then added fresh ingredients – lemongrass, galangal or ginza (which is an Asian specialty that looks like ginger but spicy and tastes entirely different so don’t try substituting ginger), coriander, kaffir, shallots, garlic and shrimp paste, and pounded together for another 10 minutes. You can also use a blender to liquidize it. If it’s too dry add a bit of water. Store curry paste in the refrigerator for 1 week or freeze for up to 6 months. Try putting them in ice cube trays so you can easily thaw what you need. The second base ingredient for many Thai dishes is the creaminess we get from coconut oil. The most authentic way to get coconut oil is from cooking coconut milk. Today most people take the easy way and use pre-package oil but it doesn’t have the same flavour. 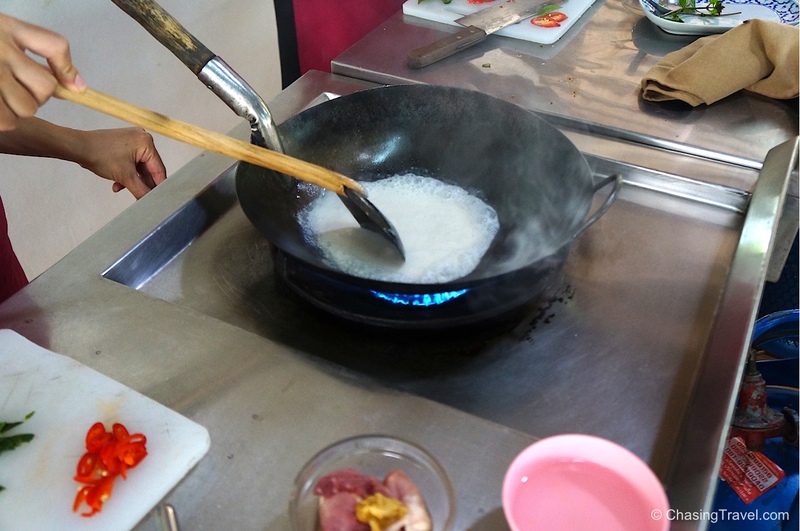 In a wok, add 1 cup each of fresh coconut milk – both thick and thin (thin coconut milk just means it’s mixed with water so if you can’t find it at the market you can just add a bit of water to the thick version). Cook the milk at low-to-medium heat until it bubbles. The oil will start to separate and then voila, you have coconut oil! Coconut milk only keeps for about 24hrs in the fridge after you’ve opened it so best to buy in small quantities. Never use it after 3hrs at room temperature. It will make you sick. Now for the curry! Panaeng curry is traditionally made with beef but you can use loin pork or chicken breast. 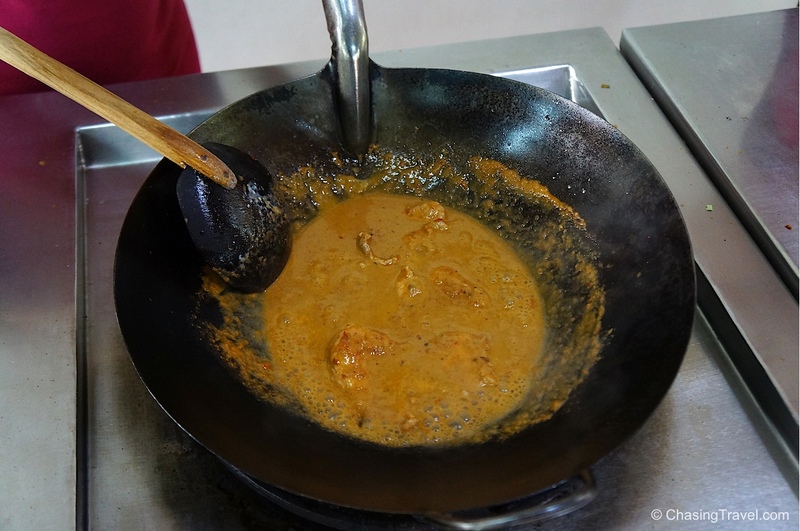 We added some of the curry paste we made in the first step to the coconut oil. The funniest part of the class was when Big Mama told us how much paste to use. If you’re Thai, use 1 tbsp. If you’re farang you should use less. With that settled, we then combined sliced pork, palm sugar, fish sauce, and some basil leaves. Panaeng curry should be creamy and thick, not soupy like red or green curries. I was excited to make this next dish – you can’t find authentic red curry chicken in the south because it’s a northern food. It’s made with red curry paste and much spicier than panaeng. 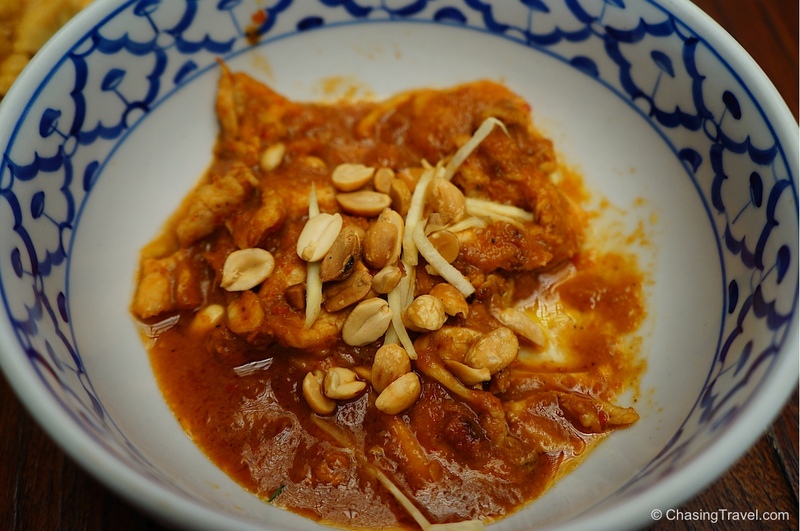 We used marinated chicken (over 3 hours or overnight) and the same cooking method as panaeng with a few new ingredients for the paste – instead of cumin and green peppers we added curry powder, ginger, tamarind juice, peanuts, and small red chillies – the hot kind. Judging from Big Mama’s reaction, I may have added a bit too many of those chillies. 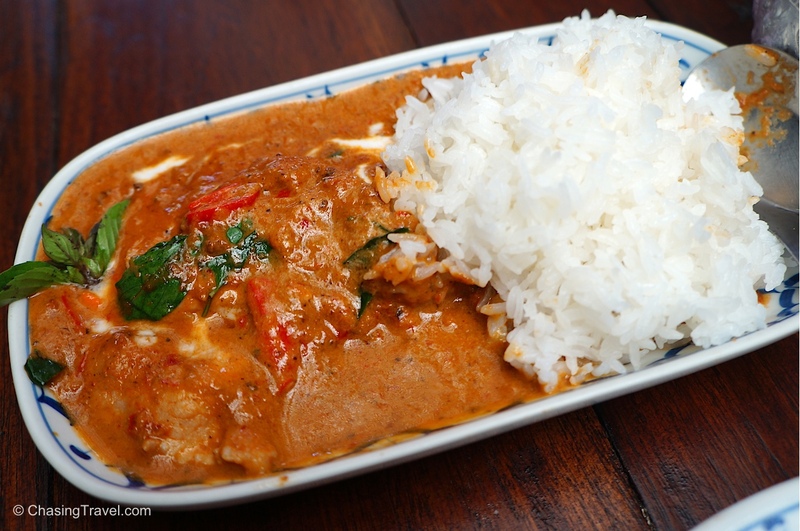 In Thailand, red curry chicken is considered a special dish – it’s served a lot at big events like weddings or to celebrate buying a new house. Red doesn’t mean hotter. The rule is that the bigger the pepper the milder it is. The smaller the pepper the hotter and spicier it will be. I didn’t know this and I always assumed that if it had chili in the name it would likely be hotter than I could handle. I guess size does matter. Green curry is spicier than red. Use big chili peppers (the mild kind) in odd numbers 3, 5, or 7. It balances the flavour. If you want extra spice in your dishes, add the seeds. If you want less spice, take out the seeds and soak the peppers in water for 10 minutes. 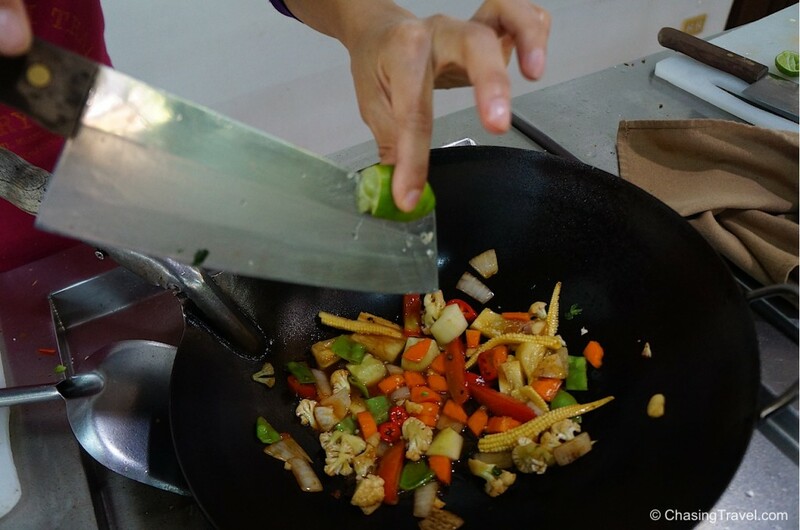 Stir Fry is a staple in any Thai home and it’s another easy-to-do dish but the most important thing to remember is separate the ingredients and cook them one at a time. We started by frying garlic, onion, cauliflower, carrot, cucumber, baby corn, pineapple, seedless red chili, tomatoes, and snow peas (in that order). We made the sauce by using lime juice, sugar and chicken stock then combined fish, oyster, soy and tomato sauces. My veggie stir fry creation! 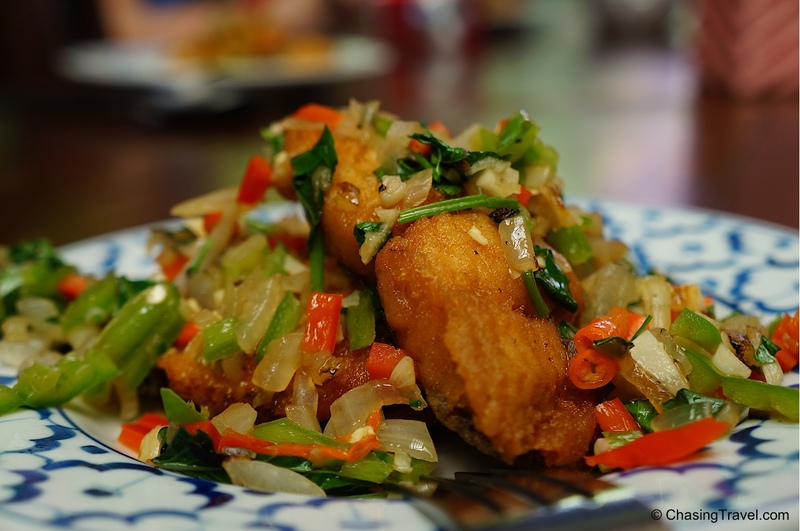 A tilapia recipe created by the owner of the school using garlic, onion, coriander, red and green chilies, fish sauce, soy sauce, chicken stock, and sweet basil. 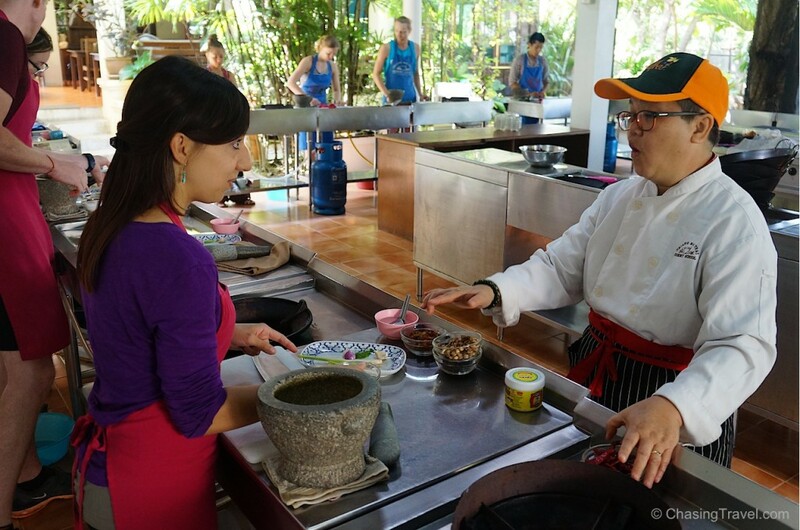 What I liked about my cooking class with Big Mama is that she teaches in a kind of watch-and-learn method. Before each dish, we first watched her chop, cut, and mix ingredients. She explains each step along the way, gives tips and techniques for extracting the most flavour and then you head into the cooking studio to practise what you just learned. Most times, instructors cook with you, call out a list of ingredients and give instructions at the same time but I find this distracting. I’m usually trying to remember each step while also trying to keep up with the others in the class. 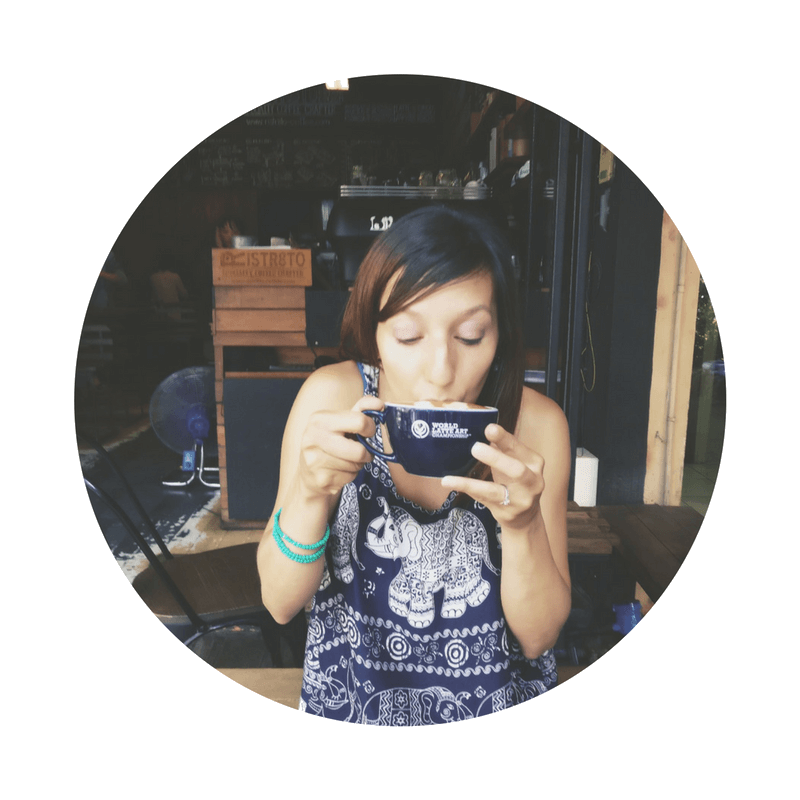 If you’re like me, I get lost easily and I need to write things down so I don’t forget – especially the ingredients and how much to use. 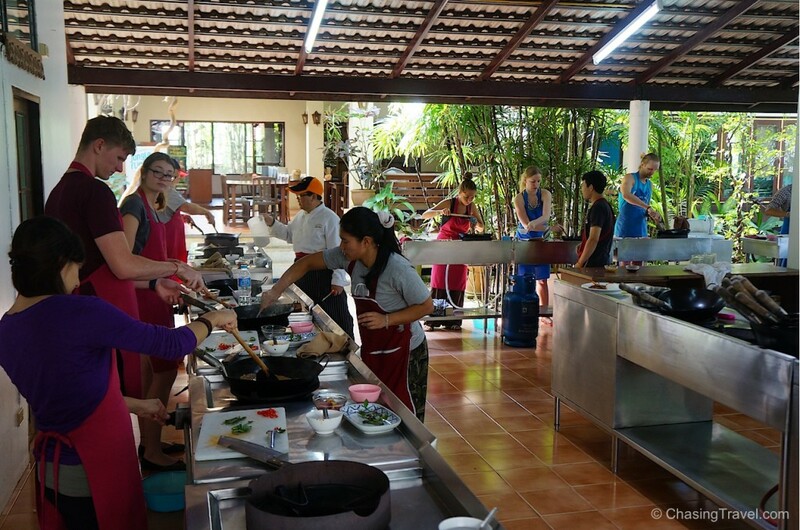 At the cookery in Chiang Mai you don’t get distracted trying to multi-task, listen, watch and do all at once. 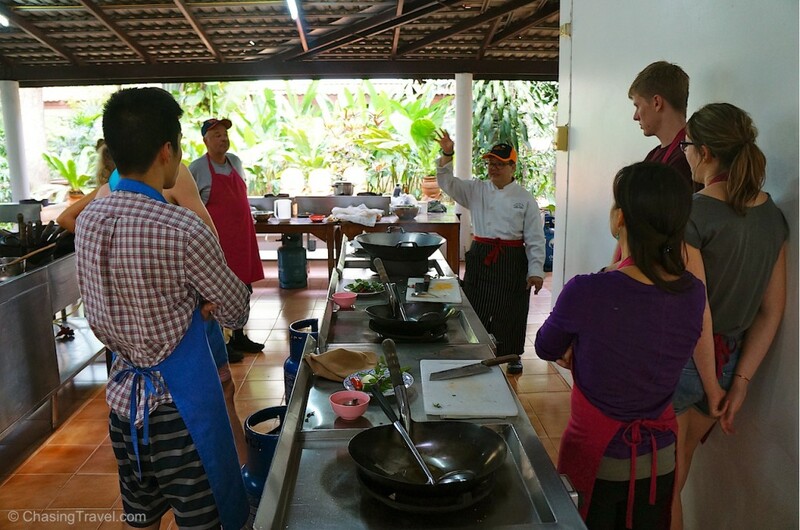 The instructors walk around during each lesson to guide you and they even share some of the history behind the dishes you’re cooking. 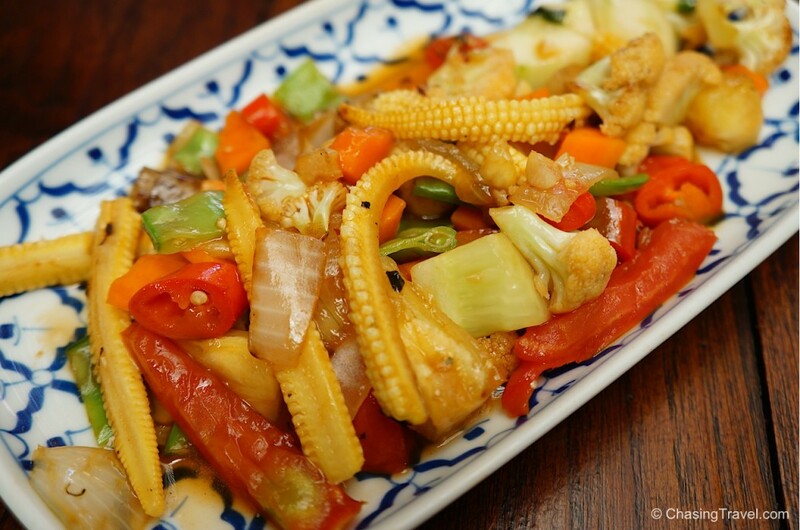 These were my very first Thai dishes I learned to make and I was surprised how easy they were to create. As long as you have the right spices anyone can master Thai cooking. One of the best things about spending time with locals, cooking and learning about their traditions is that I get to bring some of them home with me. I can’t wait to recreate these dishes for family and friends when I get back. Of course the best part of the class was the taste-testing. 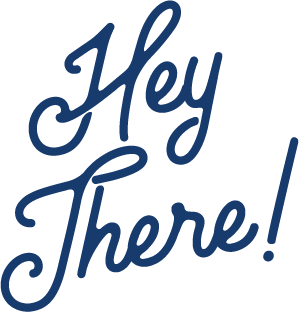 It was great to try our own creations at the end of class and sitting down with the other students from other parts of the world (Finland, Switzerland, Italy and Germany) created a really cool cultural exchange in so many ways! 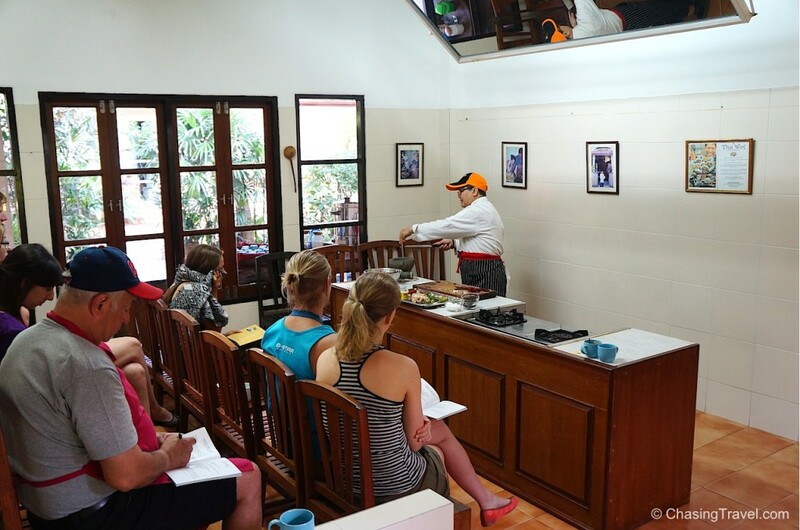 #ThailandInsider tip: Best part about taking this class is the lovely souvenir cookbook you get so you can practise the recipes when you’re at home. What an awesome gift! I was a guest of Chiang Mai Thai Cookery and Tourism Thailand on assignment for their #ThailandInsider campaign but as always, all opinions are my own. I love Asian cuisines. 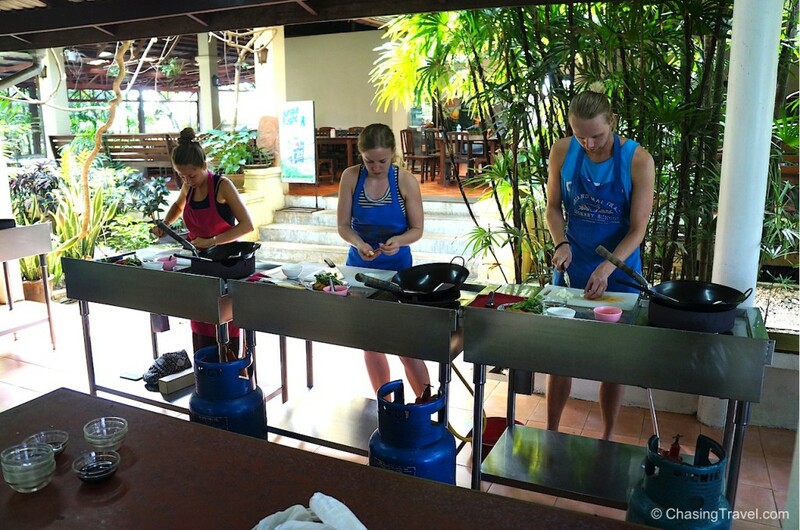 I think I would also want to have a cooking class in Thailand!